mmsonline.com October 2017 MMS 81 FEATURE space that could be occupied by other components and making the design less efficient overall. Plus, the extra stiffness that we achieve may still not be sufficient to make machining of the part viable using just a basic workholding method. This leads to Step 3. 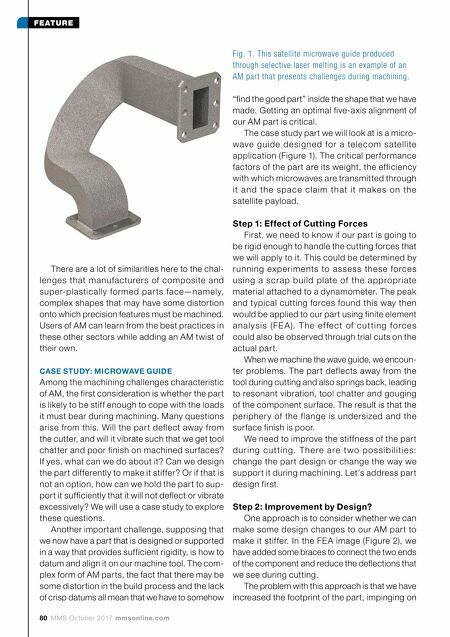 Step 3: Rethinking Workholding If we cannot easily change the par t design without losing some of the benefits that AM has provided us, then we should look at other ways to hold the component during metalcutting. We need to find a way to distribute support across the component to minimize deflection and vibra- tion without causing damage to the part as we clamp it against a hard fixture. A range of methods are available, including adhesive workholding and workholding that conforms to complex forms using an array of moving pins. But we can also consider an additive alterna- tive in which we cre ate some e nc apsulating 3D-printed jaws (Figure 3). These distribute the clamping force across the metal part, reducing the risk of part distortion and surface damage. T h e y a l s o s u p p o r t t h e m e t a l p a r t c l o s e r to th e m a c h i n e d fe atu re s, re d u c i n g d ef l e c ti o n and vibration. Step 4: Getting Ready to Machine Now that we have our part fixtured firmly and Fig. 2. 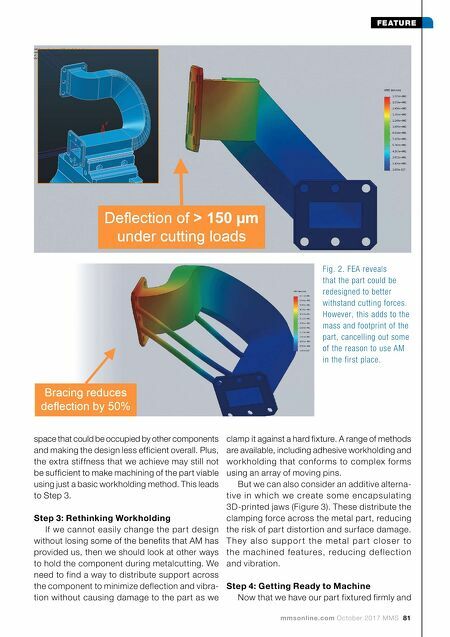 FEA reveals that the part could be redesigned to better withstand cutting forces. However, this adds to the mass and footprint of the part, cancelling out some of the reason to use AM in the first place.